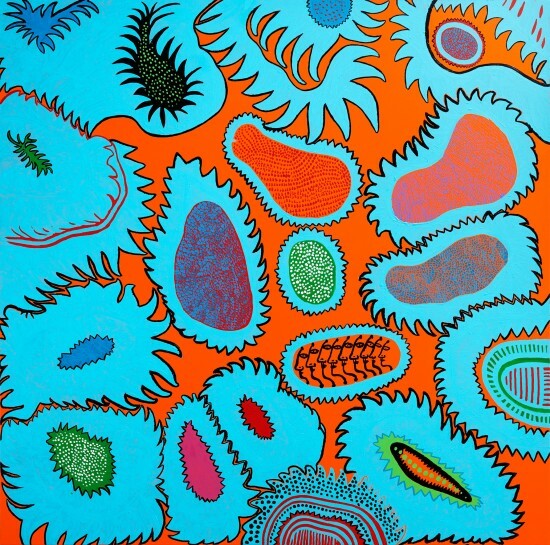 This solo exhibition by Yayoi Kusama at Sharjah Art Foundation, UAE includes a comprehensive selection of early works from the 1950s, as well as site-specific reproductions and interactive installations. From 1 October 2016 - 9 January 2017. Most recognised for her use of repetitive patterns, polka dots and nets, as well as her immersive, large-scale environments, Yayoi Kusama has worked in a variety of media, including painting, drawing, sculpture, film and performance. Moving from Japan to America in the 1950s, Kusama became a leading figure in the avant-garde movement in New York in the 1960s and a major contributor to the development of Pop Art. Since the age of ten, she has obsessively experimented with dots and the repetition of forms—covering photographs and drawings to ‘obliterate’ the image. Referred to as Self-Obliterations, Kusama would continue to develop this body of work that now extends from her early drawings and collages to include performance and film. In this exhibition audiences are invited to take part in the The Obliteration Room (2002), an all-white reproduction of a traditional domestic setting that becomes a participatory installation. Visitors are offered brightly-coloured dot stickers and encouraged to place them on the various surfaces of the furnished room. The exhibition also features a selection of her works on paper dating from the 1950s. Small scale and delicately executed, these works show the artist’s early exploration of the almost microscopic dot and net patterns characteristic of her later works. Stemming from her hallucinations, these increasingly phantasmagorical and kaleidoscopic forms are also visible in her collage works from the mid 1970s to the early 1980s. A series of these works make up a large component of this exhibition. Produced after her return to Japan, these collages incorporate her signature ‘infinity nets’ and polka dot forms in lyrical, surreal dreamscapes. Kusama’s choice of collage as a medium was inspired by her close relationship with the artist Joseph Cornell who gave her a selection of collage materials before his death in 1972. Cornell’s fascination with birds led to a series of aviary boxes that Kusama later references in her own works. Bird and other creatures are confined here in complexly patterned circles that appear almost like nuclei surrounded by auras and biomorphic fringes. Biomorphic and anthropomorphic forms also appear in her ‘aggregation sculptures’ where organic forms appear to emerge from the surfaces of ready-made objects, like parasites, encasing and engulfing them. In this exhibition, iridescent silver anthropomorphic protuberances envelope a rowing boat, almost scale-like, a pattern similar to that of her infinity nets. Curated by Sharjah Art Foundation Director Hoor Al Qasimi.